Trail running, climbing and anything in between. An outdoor blog about not keeping still and trying anything once. I love being part of a team. They're the best supporters you can get in an event. They understand exactly what you go through – from the pang of doubt that kicks in when things get tough, to the elation you feel across the finish line – and they understand why you do it all over again! So when I found an opportunity to bring a team with me to my first swim challenge, I jumped straight in. Roping in three triathletes to form a four-man swim team was pretty easy, they love a splash around. In this case we'd be splashing round five buoys in a zig-zag across the olympic-sized pool to complete four 250m legs each. For the gadget lovers, there was also a bit of technology involved. 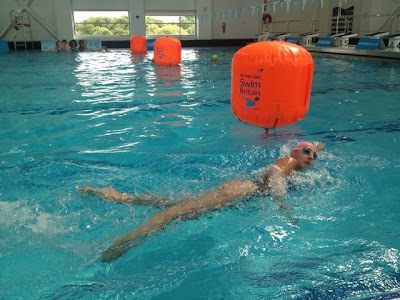 Each swimmer had a chipped wristband, which was swiped on the 'start' board before setting off then on the 'finish' board to stop the timer. This meant that only our swim times were recorded avoiding the need for speedy transitions and to break that crucial poolside rule about running! Swimmers of all shapes and sizes, ages and abilities were welcomed to the pool with great enthusiasm. Each had a different aim – to win the race, to just finish the 4000m – but all were there to have fun doing it. This made for a relaxed atmosphere, helped by the smooth organisation of the event (a relay could potentially be a complicated logistical nightmare). After a quick briefing and an introduction from swimming legend Duncan Goodhew (who I later cheesily high-fived!!! ), we all jumped in for a slightly bemusing yet fun aqua aerobics warm-up. Ready to go, we sent our first swimmer to the start and waited for his return. I was third and pretty chilly by the time I plunged into the pool to start my first leg, but I soon warmed up. It was great to swim continuously without having to touch the sides and turn around. 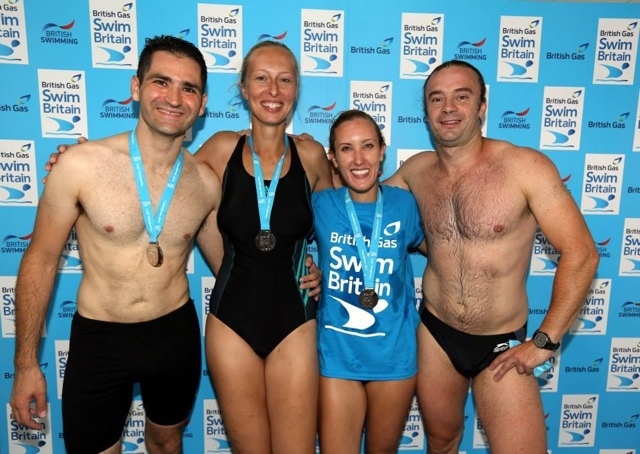 It meant I could get my strokes, kicks and breaths into a good rhythm, relax and enjoy the swim. Not too much relaxing you understand, this was a race after all! And the event-ers were poolside with their iPads to show us our accumulative team time and individual splits the moment we 'clocked out'. We came a respectable 5th out of 22 teams with a time to beat next year...!